The Huron Township Fire Department was busy this week. The department responded to three fires in a 16-hour period between April 9 and 10. During their response to all three fires, the department used for the first time two recently purchased fire trucks — an engine and a ladder truck. “I thought it was important to give our residents a snap shot of what the day of a firefighter in Huron Township can turn into. Our firefighters worked tirelessly to keep our residents safe and for that, I am thankful,” said Everette Robbins, director of public safety. The first call reporting a fire came in on April 9 at 4:19 p.m. Firefighters responded to 28000 block of Sibley Road for a grass fire. The caller reported visible smoke and flames and the fire was found to be spreading along a creek bed in the area. Firefighters extinguished the fire and cleared the scene at 8:23 p.m. While crews were still working at the scene of the grass fire, firefighters responded to the 30400 block of Prescott Road for a structure fire at 5:23 p.m.
A barn was on fire with heavy flames visible, and several explosions were reported by fire personnel on scene. Due to the intense nature of the structure fire, mutual aid was requested with Ash Township Fire Department. Firefighters battled the fire for several hours and cleared the scene at 9:51 p.m.
A preliminary investigation by authorities indicates the fire was caused due to an open burn that ultimately ignited the structure. Two Huron Township firefighters sustained minor injuries during the fire and were transported to Henry Ford Heather Center–Brownstown for treatment. 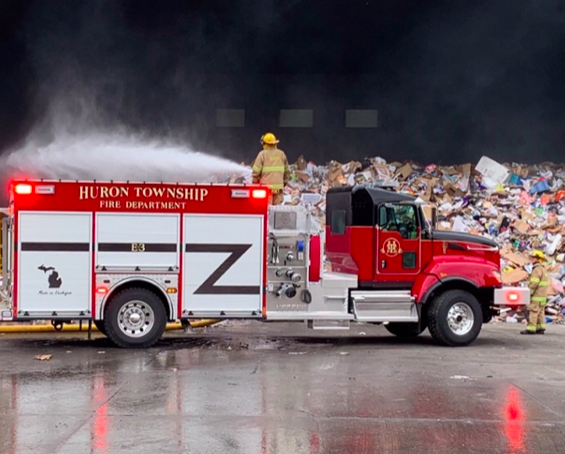 The next morning at 8 a.m., firefighters were called to the ReCommunity Huron Recycling Center located at 36543 South Huron Road for a fully engulfed fire in the garbage compactor. Police and fire responded to the scene and evacuated the building. Firefighters were at the scene until 12:18 p.m.
A Huron Township police officer was transported to Henry Ford–Brownstown with minor injuries. 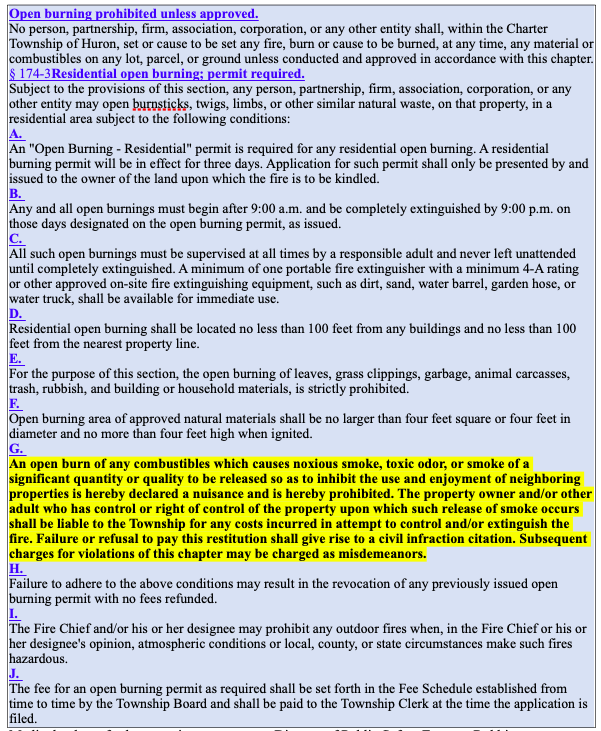 “It is important that residents know the open burn ordinance in Huron Township. It appears that two of these fires were potentially started with an illegal open burn. We were not only fortunate that our fire staff responded quickly and were able to contain the fires, but also that our first responders only sustained minor injuries. Two of these fires were dangerous situations that could have been avoided by following the open burn ordinance. We will take a zero-tolerance approach to violations of this ordinance, we have no choice as it can cost someone a life,” Robbins said. In addition to the fires, the department responded to ten other calls for service during that timeframe — nine medical rescues and one fire/smoke alarm. This entry was posted in Front Page News, Police & Fire on April 12, 2019 by Scott Bolthouse.